Apo-Clarithromycin (Clarithromycin) is an antibiotic medicine belonging to the macrolide group of drugs. Doctors prescribe it to treat many different types of bacterial infections that can occur in various parts of the body. Apo-Clarithromycin (Clarithromycin) is an antibiotic medicine belonging to the macrolide group of drugs. Doctors prescribe it to treat many different types of bacterial infections that can occur in various parts of the body. It is considered effective when used for skin infections or infections of the respiratory system, and it may sometimes be used in combination with other drugs as a treatment for stomach ulcers occurring as a result of Helicobacter pylori. However, it is not effective at treating viral infections. Apo-Clarithromycin (Clarithromycin) comes as tablets, which are administered orally, exactly as prescribed by the doctor providing treatment. Adults undergoing treatment for tonsillitis or pharyngitis are sometimes instructed to take 250mg (one tablet) at 12 hour intervals, and treatment usually lasts for 10 days. 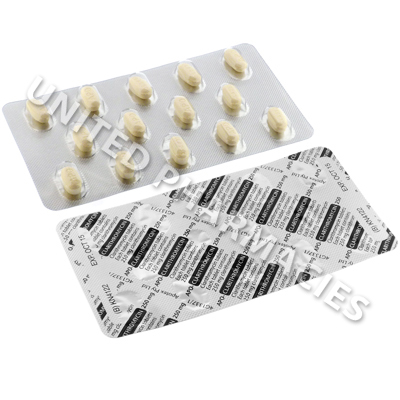 The dosage for helicobacter pylori infections, skin infections, pneumonia and any other conditions this drug is used to treat can vary, and patients must follow the dosage instructions given by their doctor. Inform your doctor if any side effects occur. In rare cases, patients may suffer from severe side effects. You will need medical treatment as soon as possible if you experience skin blisters, a loss of appetite, low energy levels, discoloured urine, severe fatigue or any other signs of a severe reaction. In some cases, antibiotics can cause colitis. See your doctor immediately if you experience severe diarrhoea. You must continue taking this medicine until you have finished the entire amount prescribed to you, unless your doctor tells you otherwise. 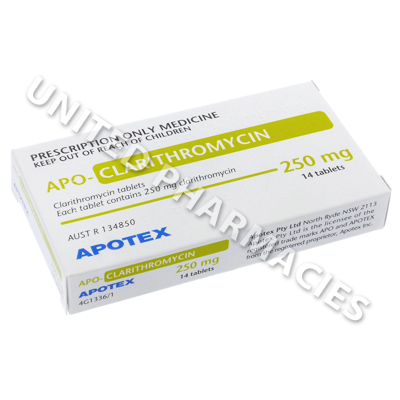 Always use Apo-Clarithromycin (Clarithromycin) as you have been prescribed by your doctor. Never self-medicate or change your dosage without first consulting your doctor. The correct dosage can vary depending on your health, medical history, and the severity of the condition being treated.